Since Xakia launched the Legal Operations Health Check, in-house counsel on five continents have completed the online assessment. Two months later, their responses provide a quantitative look at the real state of legal operations in departments of all sizes. When it comes to technology, there are clear desires and stressors – and a mixed approach to planning for and evaluating resources. 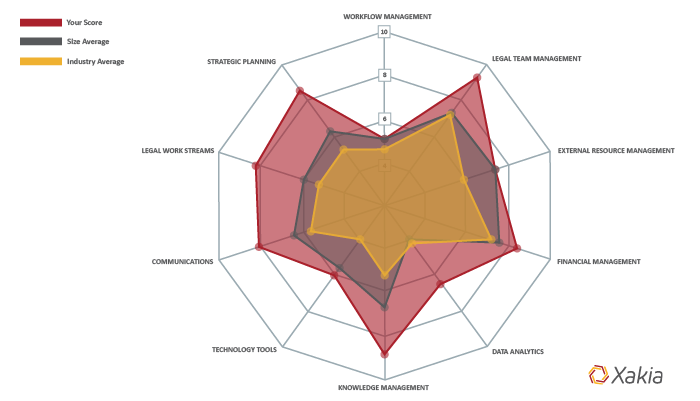 How does your department compare? What are legal departments scouting? Matter management tools. While adoption rates were under 20 percent for all department sizes, matter management is on the radar for 73 percent of teams of two to five lawyers; 50 percent of teams of six to 10 lawyers; 48 percent of teams of 11 to 50 lawyers; and 57 percent of teams with 50 lawyers or more. Litigation management and e-discovery tools. More than 40 percent of large departments employ litigation-related legal tech, but implementation is low among small and medium teams. That may be temporary; these tools are being evaluated or developed by 73 percent of teams of two to five lawyers; 65 percent of teams of six to 10 lawyers; and 79 percent of teams of 11 to 50 lawyers. Intellectual property management. This is attractive for larger teams; 74 percent of teams with 11 to 50 lawyers feel the need or are exploring options; 57 percent of teams with 50 or more lawyers are exploring options or have a solution in development. Contract automation tools. While use of contract automation tools currently tops out at 18 percent across all teams, 57 percent of large departments are either exploring options or developing a solution; another 14 percent say development is well underway. Meanwhile, 42 percent of large departments use workflow automation and “self-help” tools for client requests, but two-thirds of those said their existing tools don’t meet their needs or aren’t being used effectively. Given the potential for time savings that these tools can bring to simple, low-strategic-value work, it’s worth taking the time to get them right. Technology Roadmap: What’s the Plan? When it comes to a technology roadmap – a purposeful plan for in-house legal tech – there’s a clear divide between small and large legal teams. 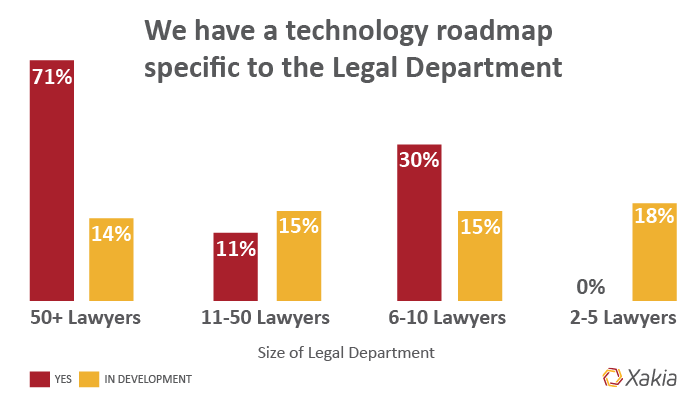 No departments of five lawyers or fewer said they had a technology roadmap; 71 percent of law departments with more than 50 lawyers said they have one in place. A smattering of midsize departments have roadmaps – one-third of departments of six to 10 lawyers, and 11 percent of 11 to 50 lawyers. Small departments may catch up soon, however; 64 percent said they recognise the value of a roadmap, and 18 percent are either exploring options or actively developing one. Taking the time to strategically consider your technology is imperative for successful corporate legal operations. Without a plan that accounts for strategy, department and business needs, timing and budget, you risk making one-off decisions that could lead to tech that doesn’t meet your most pressing needs, cooperate with other software or, most critically, work for your people. If you need help getting started? Xakia’s Create a Legal Technology Roadmap in Three Steps provides instructions and a sample roadmap template. Of course, the roadmap must be a living document, adjusting as your department, your company and the technology itself evolves. This is an area for improvement for legal teams of all sizes: Only 28 percent of large law departments said they perform continuous technology evaluations at least “moderately well”; that drops to 9 percent for small teams. According to Altman Weil’s Chief Legal Officer Survey, 57.6 percent of law departments report using more technology tools to increase their efficiency. To make the most of your time and resources, it’s imperative to have a well-reasoned plan and make smart course corrections along the way. How exactly do you evaluate the ROI for in-house legal technology? Stay tuned for our next post. It’s not too late to take the Legal Operations Health Check, an online assessment that incorporates the Corporate Legal Operations Consortium’s 12 core competencies, the Association of Corporate Counsel’s Legal Operations Maturity Model and our experience working with in-house legal departments.